We all want to eat healthy and nutritious foods that make us feel good, but don’t want to sacrifice flavor or convenience to do so. With seven common cuts of pork that are 16 percent leaner and have 27 percent less saturated fat than 20 years ago, pork lets you eat healthy and enjoy the delicious flavors you love. Plus, pork is packed with key nutrients–a 3-ounce serving of pork tenderloin is an ‘excellent’ source of protein, thiamin, vitamin B6, phosphorous, and niacin. Did you know pork tenderloin is just as lean as skinless chicken breast? Have you ever wondered how pork compares to other meats for fat, calories, and cholesterol? Today’s pork compares favorably to many other types of meat and poultry and many cuts are even as lean or leaner than chicken. To find out more, you can view this chart showing how the nutrients in pork compare to other proteins. Health professionals have an important role in helping us learn about the nutrients our bodies require and tailoring our diets to fit individual health needs. With seven popular cuts of pork meeting the government’s “lean” or “extra lean” guidelines and being an “excellent” source of protein, thiamin, and vitamin B6 (just to name a few), pork can easily be part of a healthy diet. 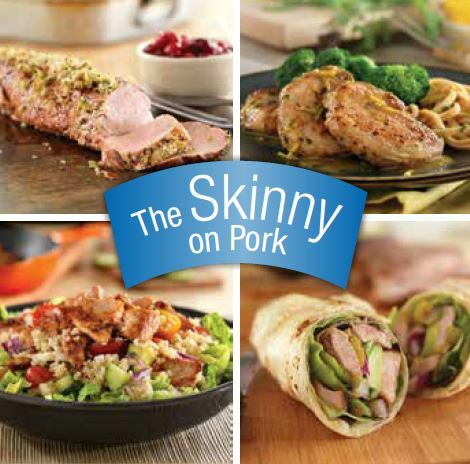 To learn more nutrition facts about pork, view flavorful recipes, and order educational materials, visit Pork.org/Nutrition.